Like many people who make webcomics, my comic-making started long before I uploaded my first comic. I first started doodling the characters that would eventually evolve into the Bob and George of today back in the 6th and 7th grades. 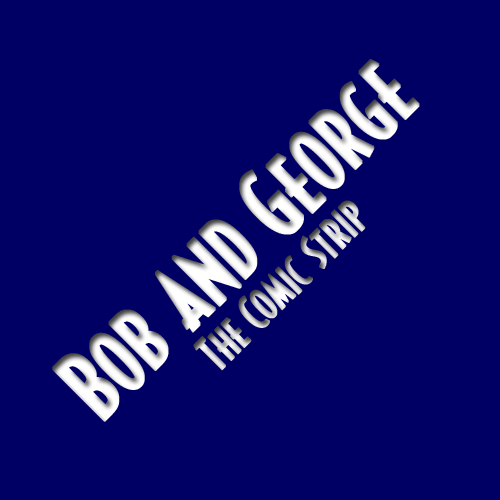 The original George was really nothing more than an unnamed stick figure with a big head with an even bigger mouth and a thick body. He didn't do much more than smile goofily and help me visually demonstrate a few concepts I was discussing in some accompanying text. He didn't have much of a personality, but when I started actually writing comic books, he developed a personality. George's first personality was very similar to that of Lenny from Of Mice and Men. The name originated from the Looney Tunes cartoon parodies of the novel's two main characters. Like many people, I didn't realize that George was actually the smart one, but the name stuck. He was paired up with a very short straight man with very large glasses named Bob. 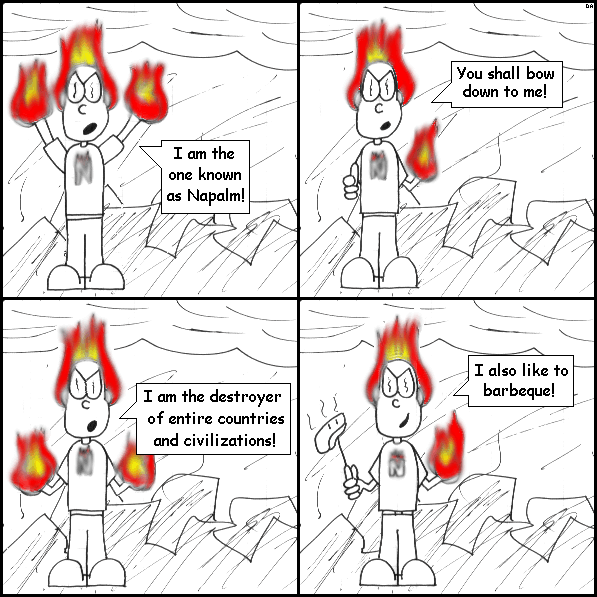 As you might have guessed, that character design eventually became Nate, while the name of Bob was assigned to a different character from another comic idea I had about a fire-based superhero called Napalm. Napalm's original alter-ego was actually named Dave, who had serious anger issues. Eventually, I decided to combine the two comic ideas, and center the story around a group of high-school kids who were inadvertantly transformed into superheroes. Sound familiar? One character gained fire powers and became Napalm, one character gained ice powers and became Sub Zero, and one character gained lightning powers and became... well, let's pretend it was Blitz, though the actual name was probably something dumber. One character gained water powers, one character gained earthquake powers, and one character became a mutant spider thing. The George in that group, who was still comically stupid, gained sonic powers; that is, he yelled really loud. Yeah, it was dumb, but it was in high school, so expectations were pretty low. When I started thinking about making an online comic, I decided to take the ideas I had from high school and combine them into one. A shame I never fleshed it out more than what you may have read in the commentary. By the way, when this comic was new, I remember I showed this comic to one of my summer instructors during a seminar on Bose-Einstein condensates. She said it was nice, but I suspect she was just humoring me.